Thanks to time lapse photography (aka, us remembering to take the occasional picture of our backyard garden) we present to you our patio planting progress over the last few months. In February it was a blank canvas. We planted about a million annuals for our backyard wedding the year before, but now wanted to introduce some evergreens and a few lower maintenance perennials for color and texture that comes back every year and looks good in every season. 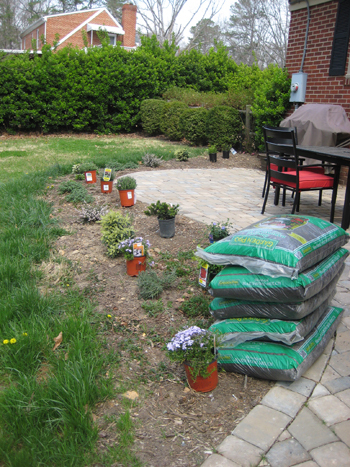 In early March we brought in a bunch of evergreen plants (which never drop their leaves) for some year-round shape as well as some hardy perennials for spring, summer, and fall color. If all goes well they’ll come back every spring through fall while the evergreens will stick around all year to keep things from looking too bare. … but by late April (thanks to all the showers) they hit their stride. And now each and every texture, shape, color and even smell (the purple flowering Catmint bushes smell nice and minty) is so worth all that digging and mulching. (Note: the other difference in this “after” is that we switched out the red seat cushions on our patio chairs in favor of neutral ones to create a more natural look). 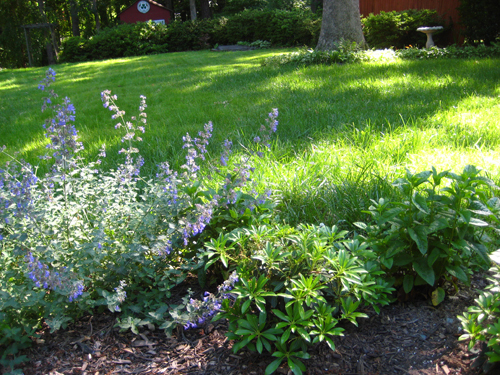 In case you’re curious, a few of our favorite evergreens are Variegated Dwarf Gardenia, Firepower Heavenly Bamboo and Dwarf Cavatine Pieris (below middle) while a few of our favorite perennials have turned out to be the aforementioned Catmint (below left), French Lavender, and Sunny Border Blue Veronica (below right). We stuck to a white and pale purple color scheme when it came to flowers to keep things looking calm and not like a crazy-kaleidoscope-of-chaos. Things will continue to fill out and hopefully by next year more of our evergreens will grow a bit larger for more presence in the bare winter months. 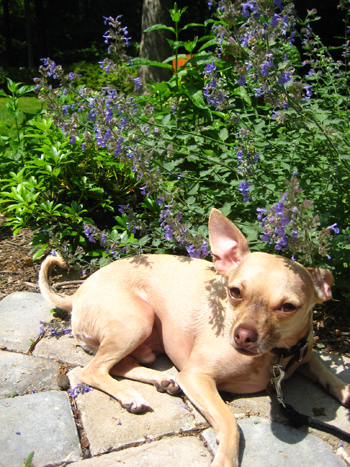 Until then, our cat sized dog can be found enjoying the Catmint (not by eating it, just basking in its sweet minty scent). Gotta love a dog who’s appreciative of our ongoing landscaping efforts. THANK YOU for showing the growth progress! It gives me hope to get outside and try to keep working (it’s, uh, not looking so good out there). Where is your cute outdoor table and chair set from? Yard is looking great!! Very inspiring to wanna be green thumbs. Howdy MIL (not mother in law, Making It Lovely)- Glad to help. We’ve totally had our share of misses when it comes to gardening, but once you find a few things that do really well and don’t look half bad (for us that’s Catmint and Dwarf Cavatine Pieris) it’s all about working them in wherever you can. We’re planning to bring some catmint into the front yard (and eliminate some of the other crazy colors going on there) and we’ve already introduced more Cavatine Pieris bushes on the side and in the front. Best of all, it looks cohesive and consistent, not lazy and safe (which it really is). Oh and a gorgeous pretty-hard-to-kill tree is a Japanese Maple… we’re too poor to buy more than one, but I thought I’d throw that out there for ya. You can get some pretty nice looking ones for about $50 at Lowe’s and they have that money back guarantee for a year so even if you manage to kill it (which would actually take some skill) you’d still get your moolah back. Hey Colleen- The cute metal table and chairs were a total steal from target.com. They’re called the “Manhattan” table and chairs- the chairs come in sets of two while the table can be purchased on its own. I remember them having really good buyer feedback and I can attest to the fact that they’re well made and certainly worth the money. I also got ’em during one of those free shipping promotions so you might wanna wait for one of those (they seem to happen every month or so) and since I saved some green there, paying to switch out the cushions didn’t seem so bad (I just picked up some tan ones at my local Target and sold the red ones at our garage sale). Hope that helps. You got these plants at Lowe’s??? Guess I’ll have to look harder, I love the look of the catmint and had never heard of it! What a pretty patio…. Love the catmint. Great job Sherry and John! I love reading your great ideas! Like everyone else has said, the catmint is really pretty. You’ve done such a great job! And I’m glad someone asked about your table/chairs, because I was wondering the same thing. Aw shucks guys. Thanks for the compliments, and stay tuned for other parts of the yard still in desperate need of a makeover. Oh yeah, mulch is the big secret. It seems weird to waste time and money on glorified wood chips, but a nice thick layer makes everything look about 100 times better than before the application, and it keeps about 99% of the weeds out (and makes plucking any stragglers really easy too). It took us a while to learn the secret (and a whole lot of wasted weeding) but now that we’re privy to the magic of mulch we can’t wait to get ours down in the spring (preferably before any weeds start to make an appearance). How did you lay your cobblestone pathway? I searched on your site and never found directions for it and we’d love to do that in our backyard. Is it really difficult? Thanks so much and I love your website!! Just three weeks before our backyard wedding we decided not to risk a failed or stressful DIY project so we hired out our patio (we got a number of estimates to lock in the best price). But Nicole over at makingitlovely.com laid her own back patio and it came out amazing (so if you check in over there and search “patio” you’ll find her post about it). Hope it helps! Lovely transformation of an old home that still keeps a sense of history to it. As for the landscaping, I was concerned to see you lawned up the front and back yards. I’m curious if you thought of other, more environmentally friendly (and wildlife encouraging) landscaping, perhaps even native to your region, that would cost about the same as grass and require even LESS maintenance–i.e. no fertlizing, watering, or mowign twice a week. Lawnmowing, in one hour, puts out as much pollution as a dozen new cars, and is a fairly sterile environment. I don’t mean to go on, but am curious how you’ve managed, of if you have, such conerns in your overall interior and exterior reno. We definitely do our part to keep things super eco around here (we have a compost bin, a rain barrel, low-e windows, and even a dual flush toilet). So we certainly considered the environment when landscaping our yard and intentionally selected regional grass seed that does extremely well here without tons of water (once established we haven’t watered the lawn at all, even through summer droughts for the past two years). We also never fertilize the lawn (sometimes we sprinkle some of our homemade compost around, but other than that it’s completely self sustaining). We do mow it in the spring and fall, but we keep the blades of grass relatively high and don’t do it as often as most people (since longer blades soak up more sun and water for healthier grass that’s low-maintenance, more deeply rooted, and gorgeous!). And the best thing about those aforementioned summer droughts is that we don’t usually have to cut the grass much in the summer at all, so it’s actually quite low maintenance and easy on mother nature as well. Hope it helps! I love looking at your website for ideas. I started to tackle our front garden bed this weekend. We’ve had our house for 2 years and all we had was grass. I got the plants in and now I’m trying to decide between regular mulch or rock. I thought I was all decided on mulch but then we’ve had several people tell us rock was better because you only have to lay it once, whereas mulch loses it color before the season is over and you have to lay it down every year. I know both have their pros and cons, how do I decide? It’s really about the look you like (does one appeal more than the other?). Mulch is also lower maintenance for weeding (we found that our rock beds still had to be weeded a lot more than our mulch ones) but it does have to be laid each season. Although rocks do have to be refreshed every once in a while because they have a strange habit of mysteriously thinning out over time. It’s all about which look you like better. Both can work! 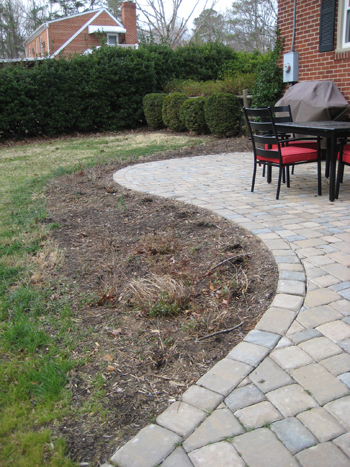 Hi…I was just wondering if you had a how to section of how you transformed your patio from the flagstone patio to the cobblestone patio you have now…also do you have photos of the process. What materials did you use? How long did it take to complete? And how much did it cost to complete? With only a few weeks left until our backyard wedding, we decided to hire out that patio work to avoid the stress and allow ourselves to put the finishing touches on the wedding tasks that we had to complete. We just got a bunch of estimates and went with the people who we thought were best for the job! Three years later we’re still loving what they did for us (we went with cobblestone-like pavers and spent a few thousand dollars for the whole shebang)! Hi! 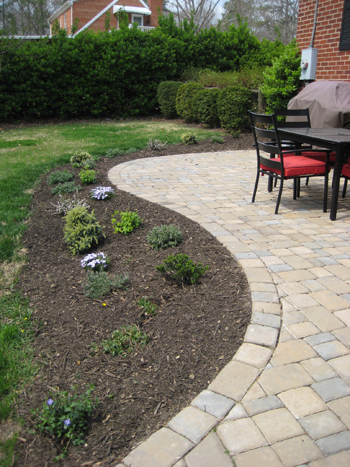 Do you happen to have a step-by-step process on how you re-did the patio? I would love to install a patio off the back of our house and would love some extra pointers! Thanks! Oh yes, just click over to our Projects page – it’s in the exterior section! I have been following your blog from last two years and have used some of your ideas while developing my patio. Your systematic information has helped me decide over taking correct steps at appropriate time. Thanks for sharing. 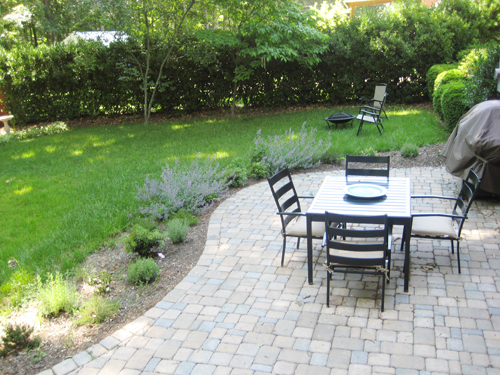 Some of the additions that I have done at my end are planting small shrubs of various colored flowers that produce flowers almost throughout the year between the blocks and the lawn. Secondly I have planted some vegetable plants that yield some tasty chilies and lemons for my personal use.